"Children will listen” -- a few of the words to a Sondheim song that always makes me cry. Maybe because it touches something in my heart that can not be identified with a simple explanation. OK, you already know this probably won’t be one of our funnier blobs, but lets see where we go. Yesterday was a memorial service for a friend, Evelyn Leibowitz. We met when she was in the White House and I was not. But I was responsible for underwriting the cost of White House personnel traveling overseas. As you can imagine it was complicated but since neither of us ever lost our sense of humor — or the absurdities of Presidential issues, we had a great many laughs. In fact, when she was the Deputy chief of Staff for President Clinton, ours was more of a problem solving (with a sense of humor) relationship, than a close personal friendship, but I liked and respected her a great deal and I think she felt the same about me. But that’s not what I wanted to blob about, although she and her husband Ed had a charmed marriage. Just an example, Evelyn worked at the Smithsonian for 13 years. She was an invaluable advisor, manager and executive. Quite simply she knew what she was doing. Anyway, everyday, (worth repeating) everyday, her husband waited outside the building where she worked, on a bench, always with a flower to give her. Lovely right? Not the end of the story. In this city of insensitive self important people, the leadership at the Smithsonian is acknowledging their love with a plaque on the bench that simply says, “waiting for Evelyn”. Gives me goosebumps. Back to, Children Will Listen. When I was six, my dad was diagnosed with degenerative type MS. In those days, this diagnosis meant he would probably not live for more that 10 years and would eventually be, at best, totally incapable of moving his arms or legs. At that time my mom was pregnant. The doctors assured her that it was not a genetic disease so not to worry about the kid she was carrying, my darling brother. (Always the Golden Child— and I get it). There were many things that happened around that time. We were living in a large one family house with my aunt, uncle, three year old Sheila, and Stevie, who was two weeks older than me and from whom I had never separated — not at home or in any school we attended. Like twins, we had our own language, celebrated our birthdays together and our parents were interchangeable. We also had a multitude of aunts, uncles and cousins who were always around, and the mothers were interchangeable. My parents were constantly looking for a cure which required all of us or them to travel to many different places. Nothing worked. But when they went and left us, we were stored at the home of one of the 4 aunts all who lived within a mile. Or with the other siblings who lived an hour away, but also within a mile of one another. Where were we? Oh yes, as a child I believed that I was going to lose my dad. He was a great dad. Chocolates in a beautiful box on Valentines Day, unconditional love, and the belief that if I set my mind to it, I could do anything I wanted to do. But he wasn’t going to be around for very long. It was clear that I couldn’t love him very much because I was going to lose him. Do I have abandonment issues or what. just FYI, My dad lived longer than 10 years, but I knew he was going to leave me sooner than later. Ten years ago this week, I hopped a plane to Houston, rented a car, and headed north to the Louisiana line. Even though it was already 5 months since the calamity of Hurricanes Katrina and Rita, getting through the National Guard roadblocks took a bit of negotiating. Once across the border, I found myself in what had been Holly Beach, LA, part of what was known as the "Cajun Riviera." Nothing was left standing, with the exception of a few sturdy toilet bowls. What had been a thriving beach community was shredded in the cuisineartstyle winds of Rita. You could see by the outlines of the remainders of house foundations where there had been something. But it was gone, turned to dust, and spread out for miles. It was a sobering sight, and as I drove on to Lake Charles to find a place to spend the night, the visions of that destruction weighed on me. I was doing my first National Geographic story in 21 years (also known as the "I just had a kid, and don't want to be away for 8 weeks any more..." break) and had brought with me my small, varied arsenal of camera gear: A Canon 5D, a Holga, and a Speed Graphic, the latter equiped with lenses from the FDR era. When you shoot for Geographic you have to keep in mind that no one will see the pictures for months, maybe years, owing to the long lead times. So, swirling in the back of your mind all the while is that little voice which is urging you to try and forego the obvious picture, whatever that might be, and look for something which hopefully has a bit more staying power, and relevance. Of course at the moment, you have no fricken idea what might be relevant, so you enter the crap shoot, keep your eyes open, and tread gently. Herbert Gettridge, 83, was the first person to move back into the Lower 9th Ward, walks into his flooded house for the first time. He built his house wall by wall, room by room, in the 50s and 60s, and wasn't about to just give it up. At the end of the 2nd day I'd arrived in New Orleans, the epicenter of the Katrina destruction. At first glance Canal street didn't look so bad. I checked into a nice hotel whose commo still had not been restored (that would eventually take months to complete.) I wandered on foot about the French Quarter, which was one of the few parts of the city to still feel like the pre-hurricane NOLA. The next morning, I was ready to roll: the 5D was armed and ready, the Speed Graphic & accompanying film holders were out of the bag and crying out to be picked up. I went to Cafe du Monde, that one unchanging spot of morning good will, and had an order of beignets, sticky sugar and all, and a large cafe au lait. Then I wandered the 20 minutes back to the hotel, walked into my room, now festooned with bits of photographica in every corner, grabbed my notebook, sat down, and remained in a paralyzed stupor for the next 10 hours. The tv was on, probably CNN (in some kind of hopeless gesture that I might 'learn' something...I'm sure that didn't happen) and I sat in that room till sunset. Thinking. Worrying. Pondering. Worrying. Imagining. Worrying. Wondering, and a little more Worrying. The weight of expectation was taking a giant toll. And God Forbid! I thought, that my wonderful editors at NGM might learn I was there a whole day without doing a damn thing, without taking a single picture. I may have picked up the Speed Graphic once or twice, maybe even cocked the shutter, and fired it, just to hear that reassuring sound of rubberized cloth and spring steel. 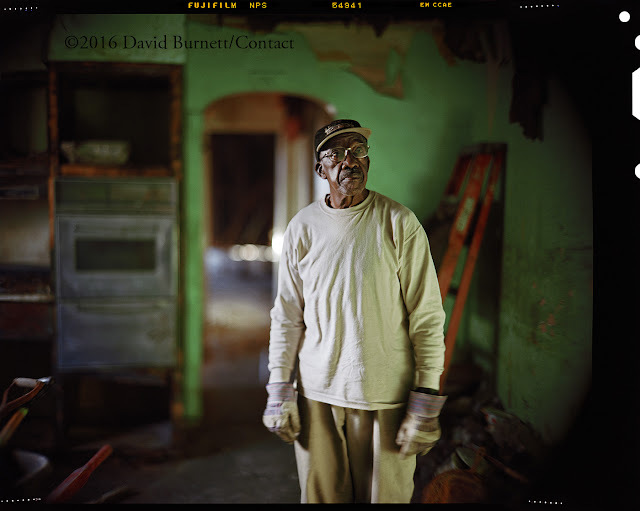 The third day, I got in touch with the photographer David Rae Morris, a NOLA transplant who knew his way around, and who generously helped me to find a way to start actually shooting pictures. David had a blue pick up truck, and we'd throw gear in the back and do slow meandering passes though some of the toughest hit neighborhoods, looking, 5 months post facto, for pictures to tell the story. At one point, we were going thru a neighborhood which didn't look too badly hit (there were some) and in a moment of complacency we were speeding along, as if to some pre-defined photographic location. "Slow down..." I said, and as he slowly braked the truck, David asked what I'd seen. "Nothing," I said. "It's just that I feel we're dishonoring this place by driving through it so quickly that we can't really see." For the rest of our several weeks, I don't think we ever drove any faster than 35 at the most. 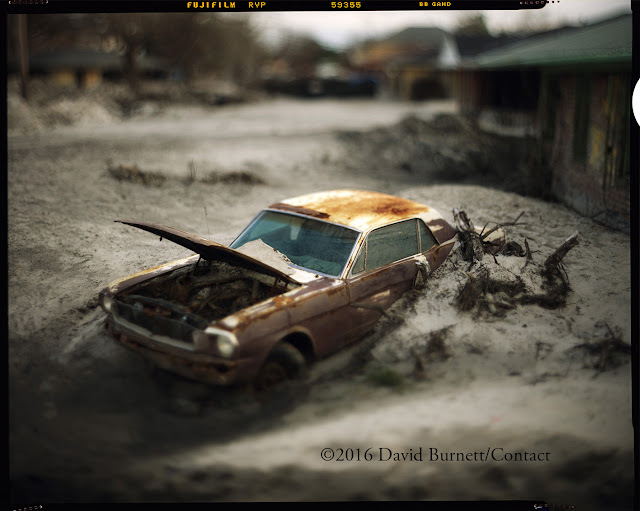 In a neighborhood whose dyke broke, unleashing water and sand, a forlorn Mustang sits, half buried. Eventually, as I became more comfortable with figuring out the where, and how of the city, the pictures started to come. But it was always the simplest moments that were the strongest for me. In the magazine, the story was pegged to be on the likelihood of a new wave of "Killer Hurricanes." Yet for me, the pictures which mattered most were those which told very personal stories. The traces of what life had been just a few months before. In many ways , much of what has changed in the last ten years has to do with the media world. The magazines that I'd known and worked for since the 70s have gone through wrenching changes, and as their lunch is served up rather unceremoniously by the new digital online world, I realize that finding a magazine with resources to send you for a month on a story like the post-Katrina coast is just plain unlikely. Photographers are trying to fill those gaps by self-funded projects, looking for a rare assignment here or there, but the pickings remain remarkably slim.